The dogs (Buddy, Teemo, Oscar, Mia, Salty and Molly) were left in the car for 45 minutes and all died of heatstroke, according to Petsearchers Canada spokeswoman Alesha MacLellan. MacLellan went on to say that, in a panic, the dog walker hid the bodies and told the owners they had been stolen. She admitted the truth only after a search effort had begun. This shocking incident will undoubtedly leave a lasting effect on the pet parents involved. 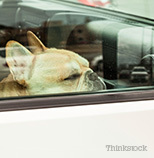 While nothing can mitigate the loss we hope that others will be reminded of the dangers that come with leaving a dog in a hot car, even with the windows down!